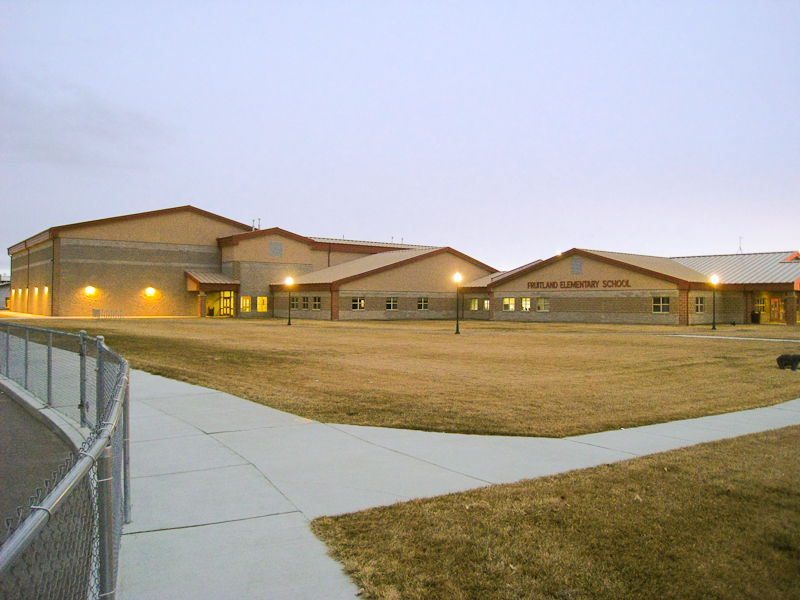 A new 70,000 Square Foot Elementary School Building was the centerpiece of this $7,500,000 expansion. 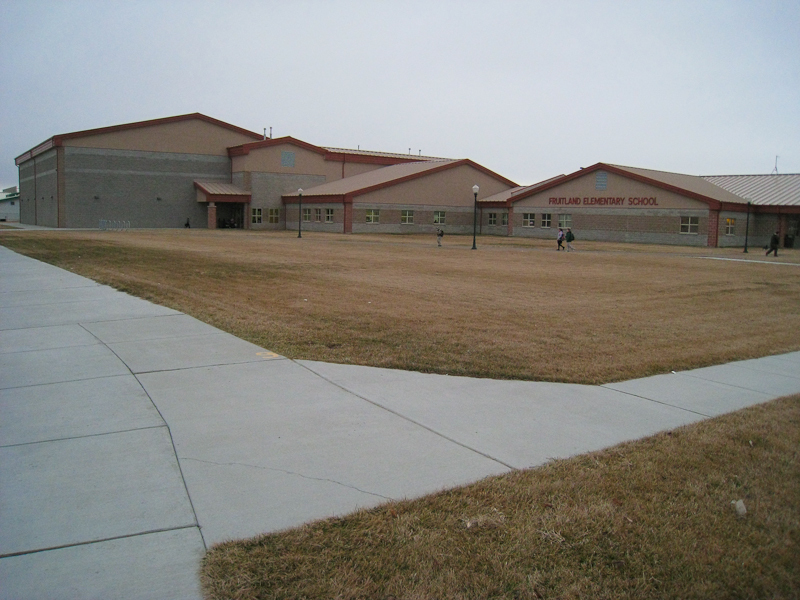 Included were 32 classrooms, gymnasium, cafeteria, library and technology center. 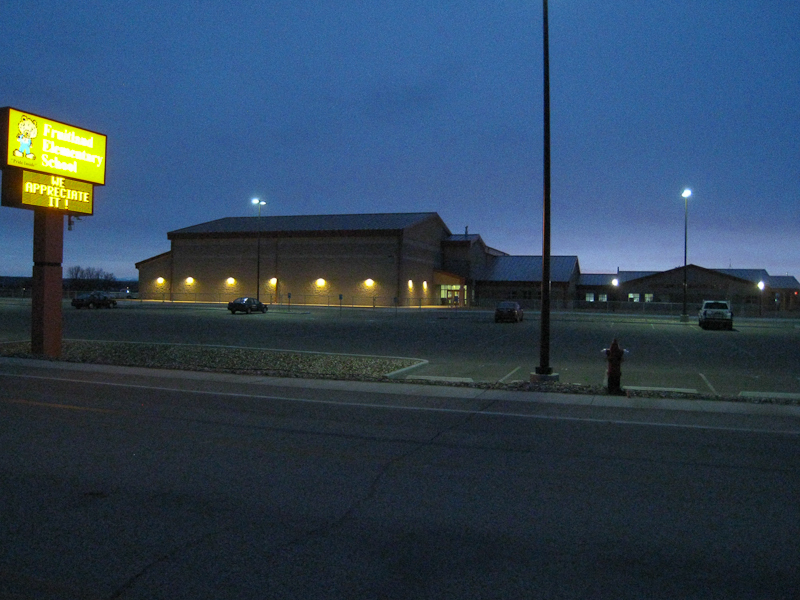 The High School Gymnasium existed but lacked adequate locker rooms and dedicated Physical Education. A roughly 6,000 Square Foot addition on the right side provided these essentials. 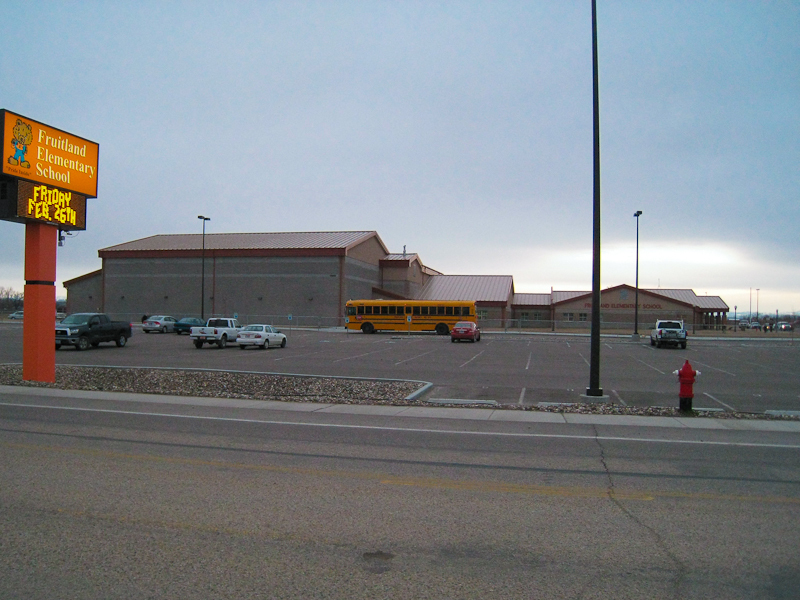 The project also included a new 8,000 Square Foot free standing Music Building addition to the High School Campus. The old Elementary Building was remodeled to become an Intermediate School. 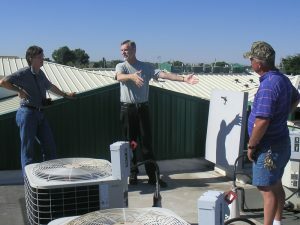 The Electrical Design started July 20, 2005 on the roof at the Fruitland Middle School with myself and the two Architects listing to the maintenance superintendent and discussing design concepts. 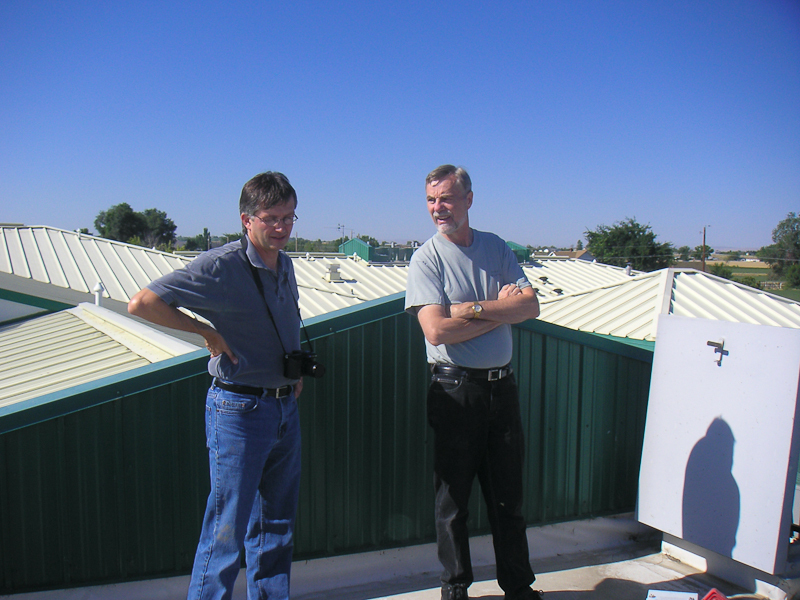 Having the compressors on the roof was a must for the new Elementary School Building we were about to tackle because it solved a number of problems for him such as having them away from the kids and ease of access. 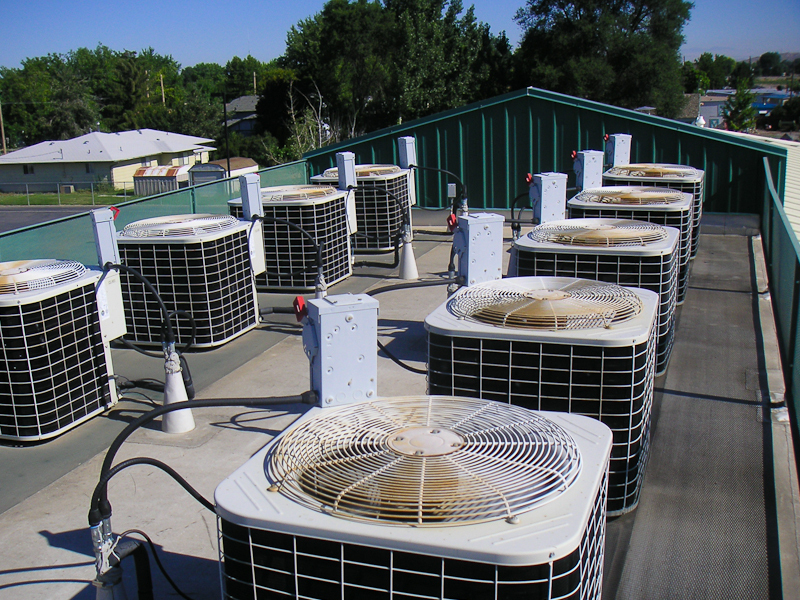 Many other client preferences were incorporated as well. 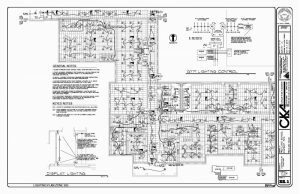 The Electrical Design included Drawings, Specifications, Submittal Review and work with Construction Electricians on the job. Footprint of the building at 1/16” scale on Sheet E1.1 – one of 20 sheets in the Electrical Design Drawings. Gymnasium upper left, cafeteria to the right. Office and administration lower left, almost everything else is a class room. 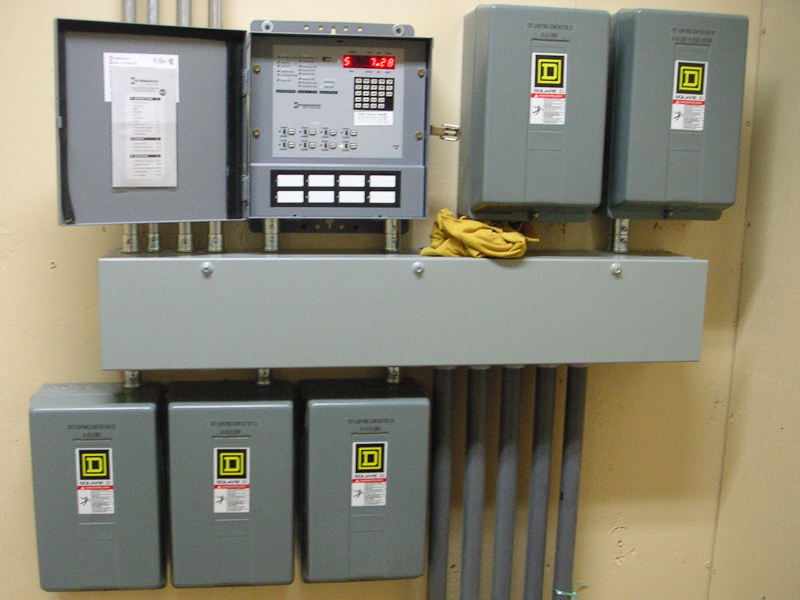 The 2,000 Amp, 3-phase switch gear just to right of the cafeteria fed distribution panel boards throughout the building using underground feeders. 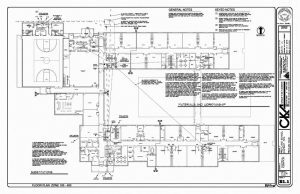 Sheet 2.1 one of four Lighting sheets encompassing the office area, a portion of the South wing and class rooms. During construction a field trip to a recently completed lighting project was arranged for teachers and administrators to see firsthand class room lighting with a slight bluish daylight cast. Everyone loved it. 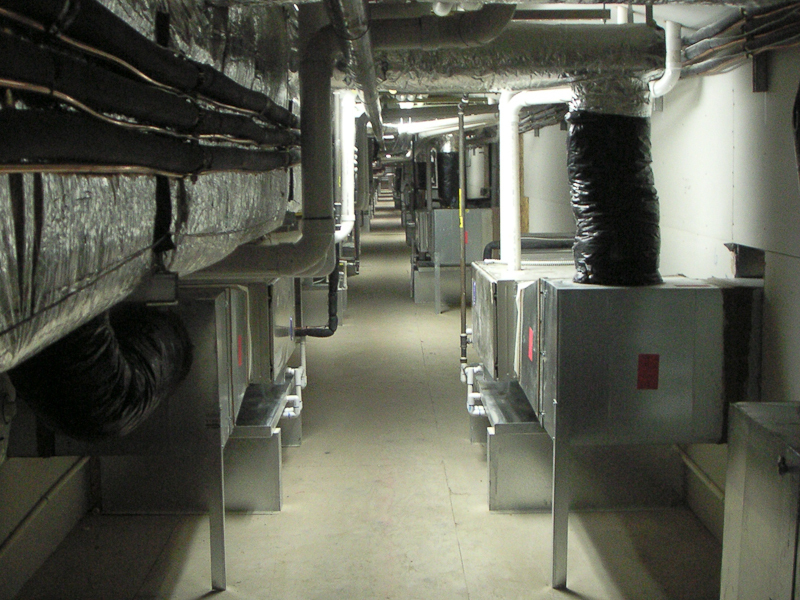 As a result the lighting throughout the project were specified 6000° Kelvin. 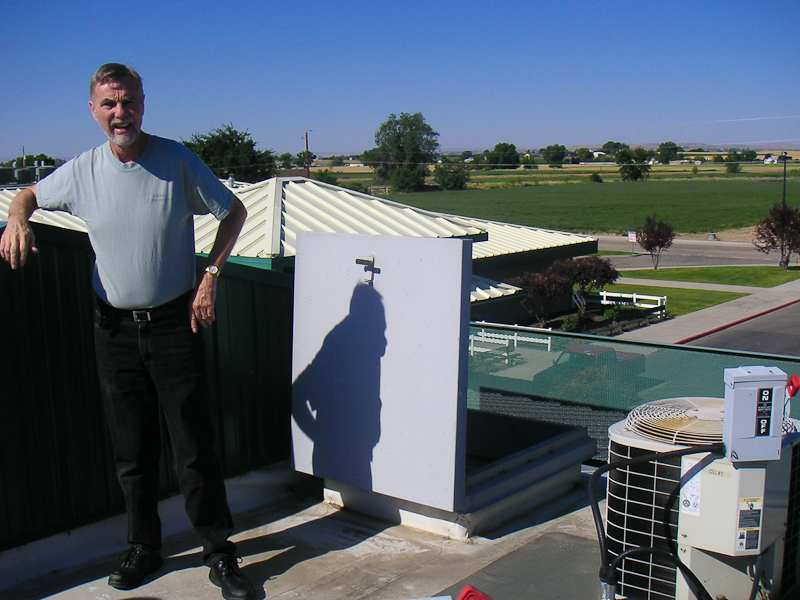 Part of the Electrician crew at break time on a hot afternoon. A frequent guest is the Elementary School Principal, Mr. Joe Wozniak. 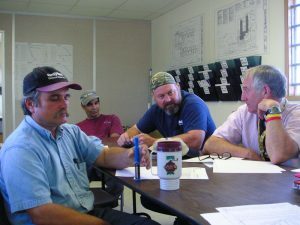 Like others in the district he had a personal interest in the design and construction and would often visit the job site to stay abreast of the progress. Breaks were also a good time for feedback from the electricians about any concerns or difficulty they may be having with the design. Our Rotary Club provides free dictionaries every year to the third grade class. 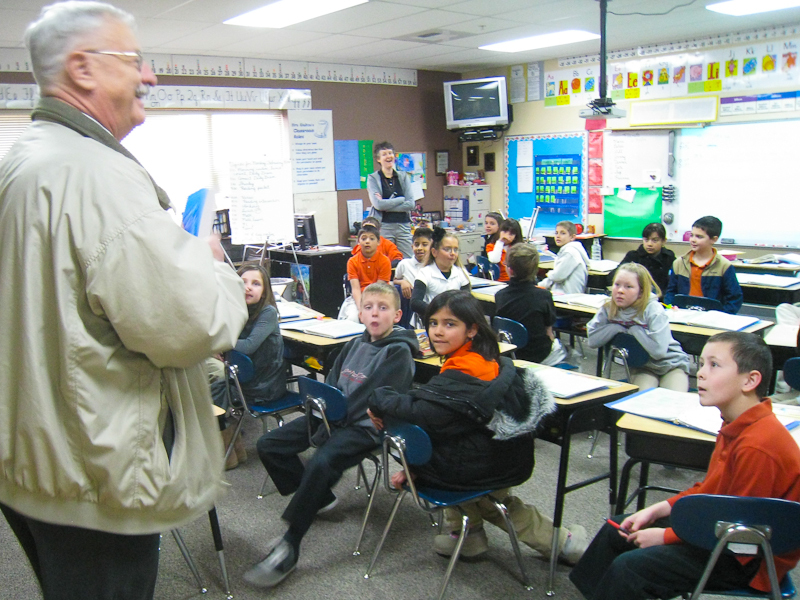 Here is the Project Structural Engineer, Stu Edwards, PE in one of the third grade classrooms about to pass them out. Teachers appreciated having multiple light levels in the classroom. This was one of the features of the lighting design and was accomplished in a cost effective manner through the use of dual wall switches rather than the more expensive dimming ballasts. 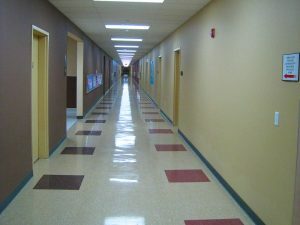 Expansive hallways connect all classrooms. The District chose T8 lamps, electronic ballasts and multi-level switching in the classrooms. Lighting throughout the building is controlled using energy saving occupancy sensors. When it comes to computers the school is a technology show place featuring a high speed Cat 6 network. 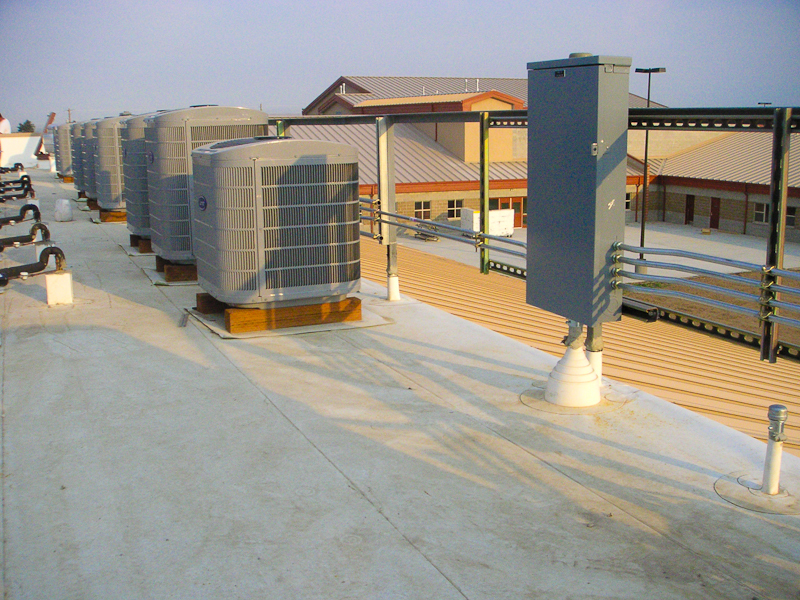 Two cable trays above the T-bar ceiling on either side distribute network data cables as well as other wiring for functions such as Fire Alarm, intercom, etc. 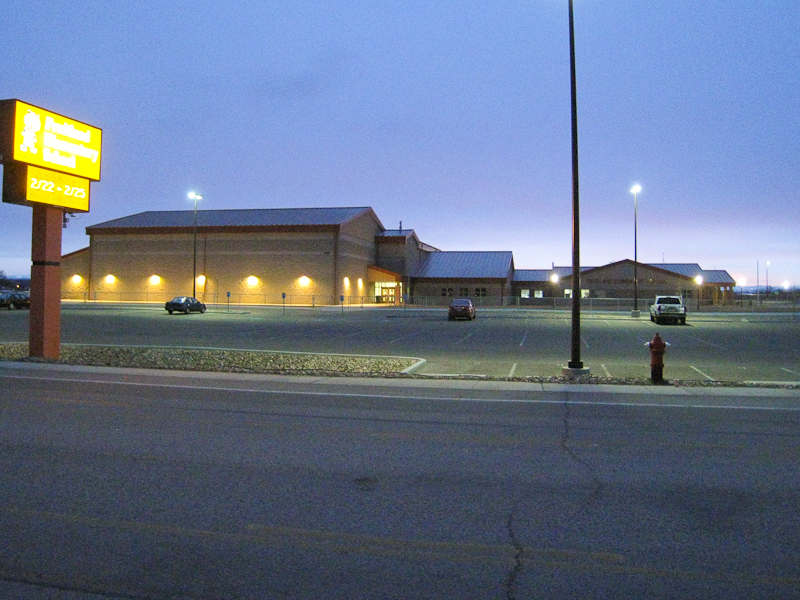 An early morning view – part of the 10 Acre campus and building accent and sidewalk lighting. 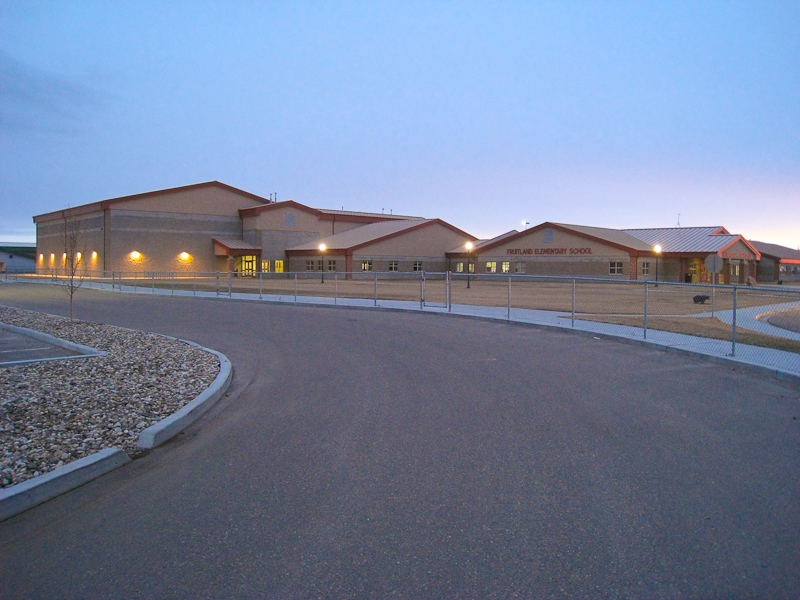 There’s also a lighted walkway connecting the Gymnasium to the Main Entrance on the South Side. When you’re in the area, check it out. Its just off Highway 95 to your right traveling North from Interstate 84 Exit 3. Two years later (July 12, 2007) the Project complete and ready for the start of a new school year in the Fall. 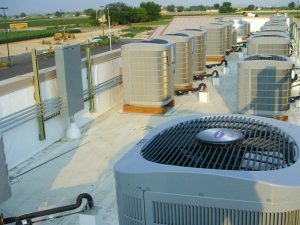 Compressors on the roof but with refinements including a panel arrangement eliminating individual disconnects at each unit and reducing the number of roof penetrations. Just one of the many other district preferences that were accommodated in the Electrical Design.